As an intern at RMG for four months I was given an unusual project. 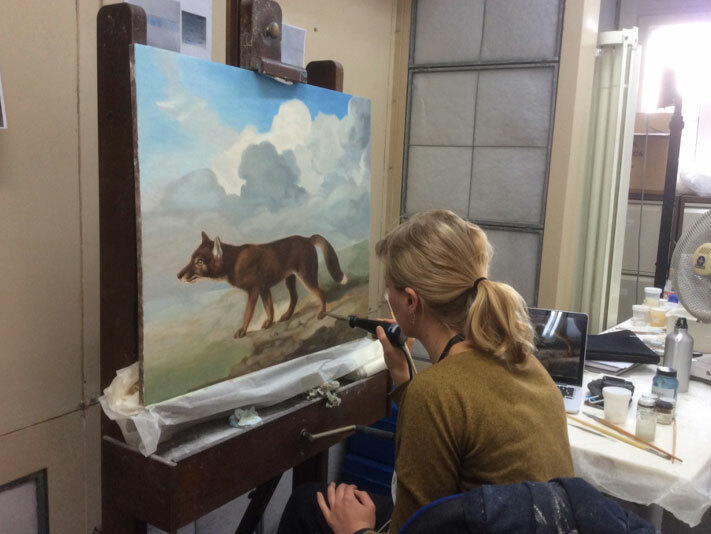 Working in the conservation department, I was tasked with producing a replica of Stubbs’s Dingo, using a poorly understood and eccentric wax painting technique. 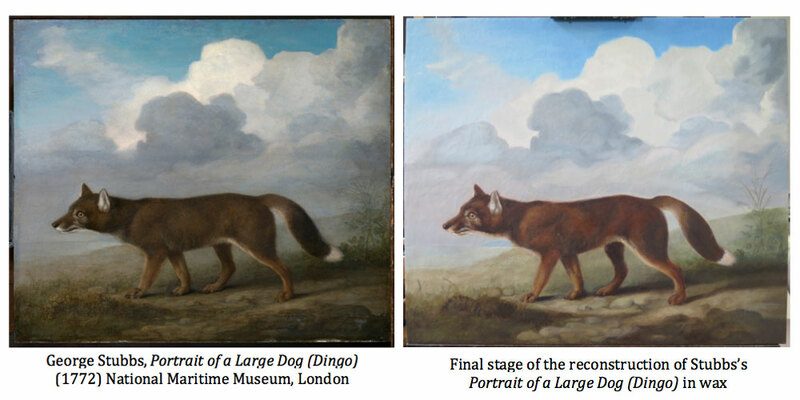 In preparation I carefully studied the pantings acquired by the museum in 2013, Portrait of a Large Dog (Dingo) and The Kangouro from New Holland, both painted in 1772. Scientific analysis carried out by the National Gallery, London indicated these paintings to be almost purely beeswax rather than the traditional oil paint, a fact that is surprisingly difficult to discern by eye. My project as an intern was to attempt to understand, on a practical level, the way that Stubbs may have used wax as a paint medium. Stubbs, a prominent late eighteenth century painter noted for his paintings of horses, was commissioned for the task of producing the first Western paintings of Australian animals. The paintings were informed by artifacts produced by Cook’s expedition to the Pacific in 1768-71 on the Endeavour. 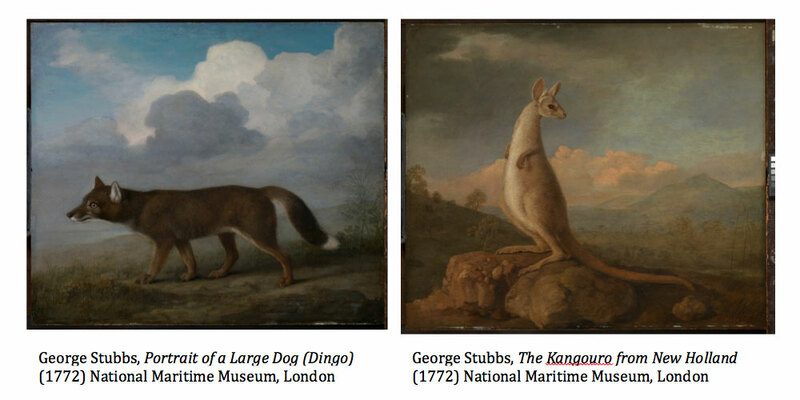 In the case of The Kangouro from New Holland, Stubbs was able to either inflate or stuff the skin of a kangaroo, which was brought back to England, in order to gain an understanding of the form and three-dimensionality of the animal. However, Portrait of a Large Dog (Dingo) was created merely from verbal descriptions of a brief sighting of a dingo. The major difficulty for me was Stubbs’s resolute avoidance of any type of documentation; he appears not to have kept any notebooks or records of his methods and materials. In the absence of Stubbs’s own words, my most valuable source of information were the mid to late eighteenth century treatises discussing wax painting. Stubbs clearly wasn’t alone in his interest in beeswax. The seminal treatise was by the Comte de Caylus in 1755. Caylus interpreted the writings of Pliny the Elder, the Roman author who briefly discussed artists’ use of wax and heat (a combination referred to as encaustic painting). For Caylus, this was a discovery of the technique of the ancients, and he longed for eighteenth century painters to return to this medium that appeared so durable and vibrant. Caylus spurred on a bout of other references to encaustic painting; letters and treatises appeared in England shortly after, and chapters were written in artist handbooks. This surge fitted in to an overarching desire for experimentation prevalent among artists at this time. I compiled the recipes and methods discussed in the treatises and tested each of them, assessing their working properties and aesthetic qualities. The infusion method was decided upon as the most suitable technique. 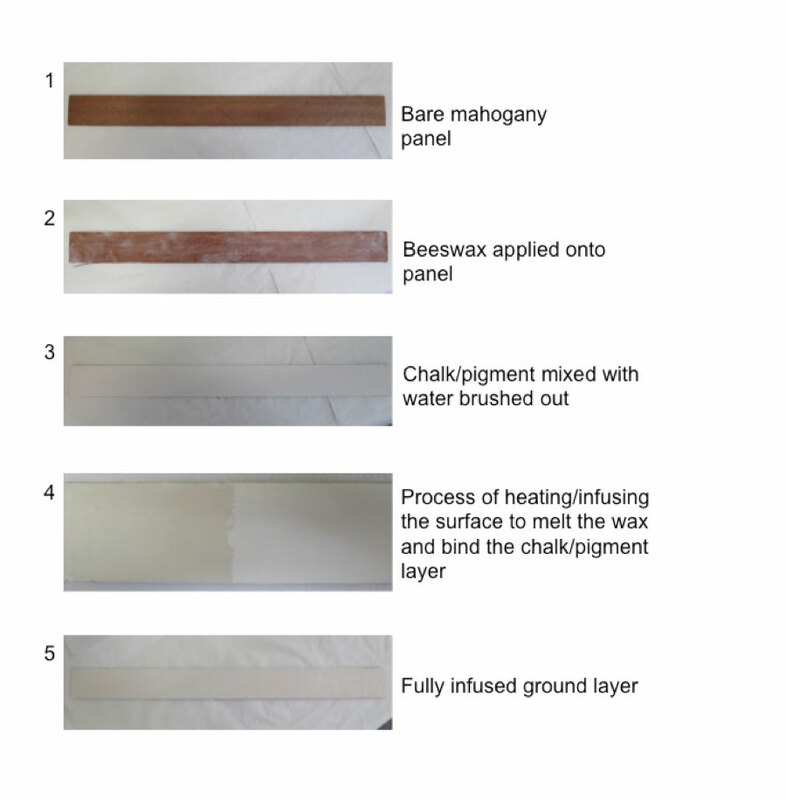 The technique involves rubbing wax into the panel, then dusting the surface with fine chalk. 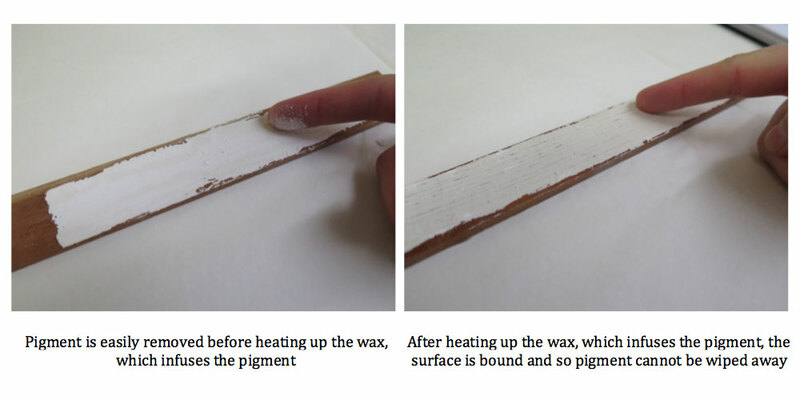 Dry pigments are mixed with water, which you can then paint over the surface, despite the wax layer’s natural resistance to water-based materials. On completion of the painting, the treatises describe holding the painting close to a fire, to melt the underlying layer of wax (for this part, I used a hot air gun). The wax then infuses and binds the pigment and once cooled, the painting is set. 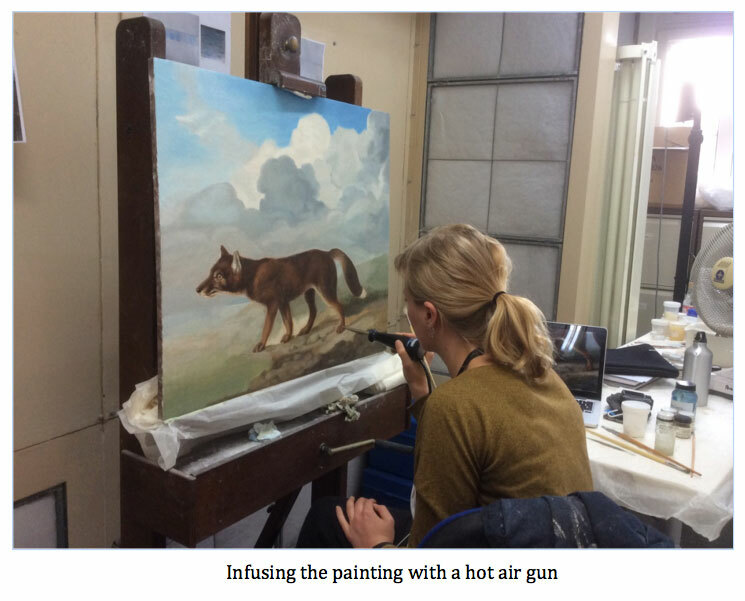 On testing this method, it was found to have very fluid working properties and could be applied in multiple layers – a characteristic of the paint layers on Stubbs’s painting. I tested out another method, which involves melting wax with a solvent and mixing in pigment to paint out, but I found it to be much more difficult to brush out and it could not easily be built up in layers. 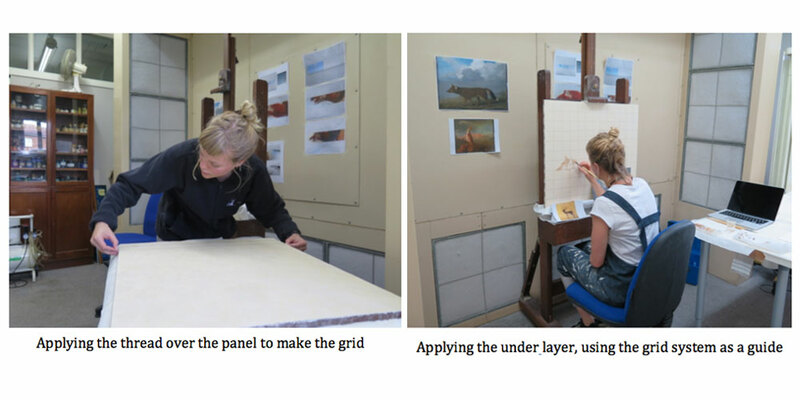 In order to ensure an accurate copy of the dingo, I squared up an image of the painting and strung a grid system of thread over the panel. The surface of the preparation layer was lightly dusted with chalk, and a wash-like underlayer was painted on using earth pigments bound in water. 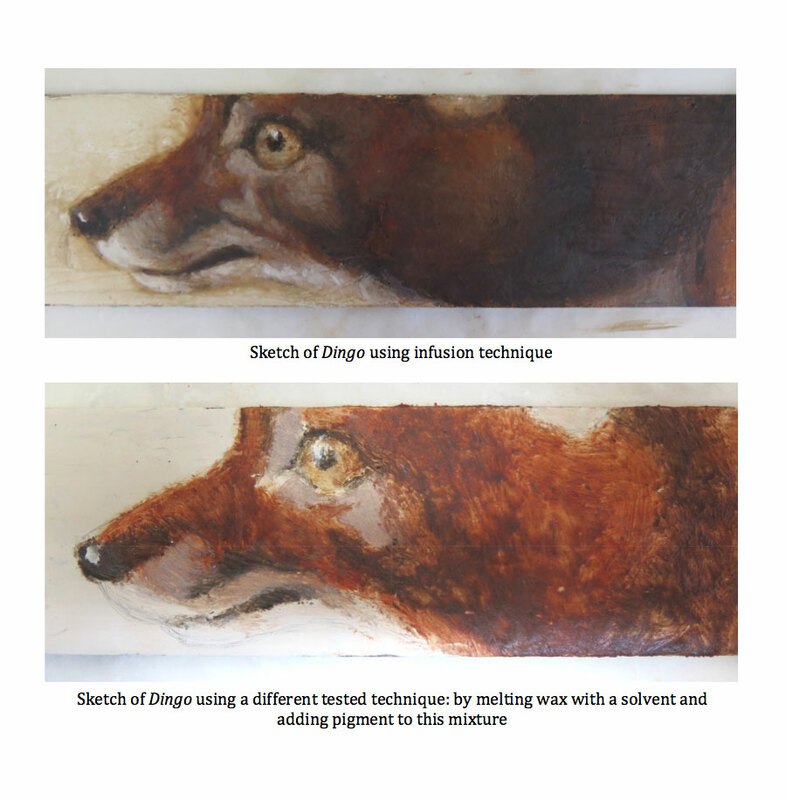 After infusing this layer, this same process was repeated until the image of the dingo had been built up. My greatest difficulty with this technique was predicting the colour change that occurs after heating up the wax, as it often goes much darker. 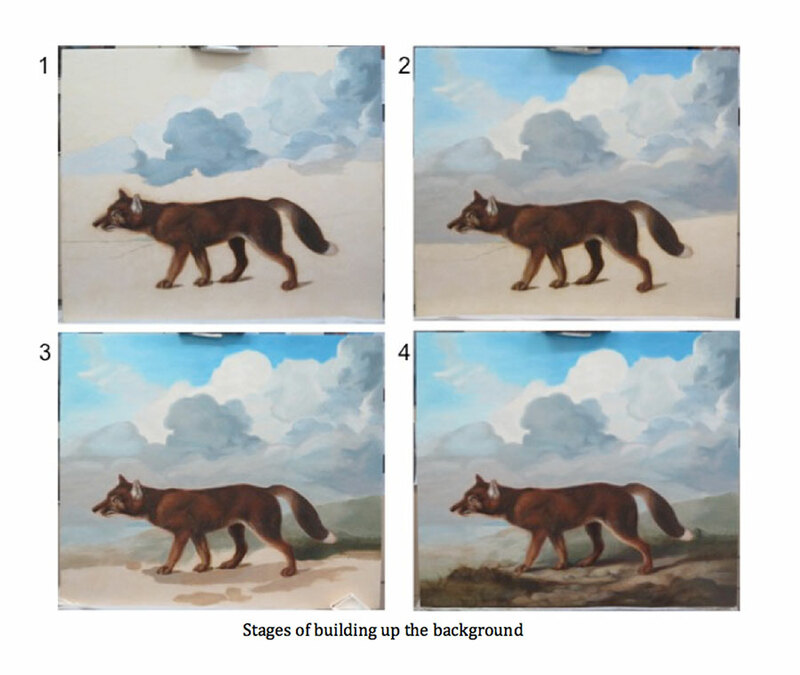 The figure of the dingo was brought to a stage of relative completion before moving onto the background, as Stubbs often worked in this way. On Stubbs’s Dingo, brushstrokes of the background colour are visibly skimming over the outline of the figure of the dingo, indicating he applied the background second. We still can’t be sure how Stubbs painted with wax. 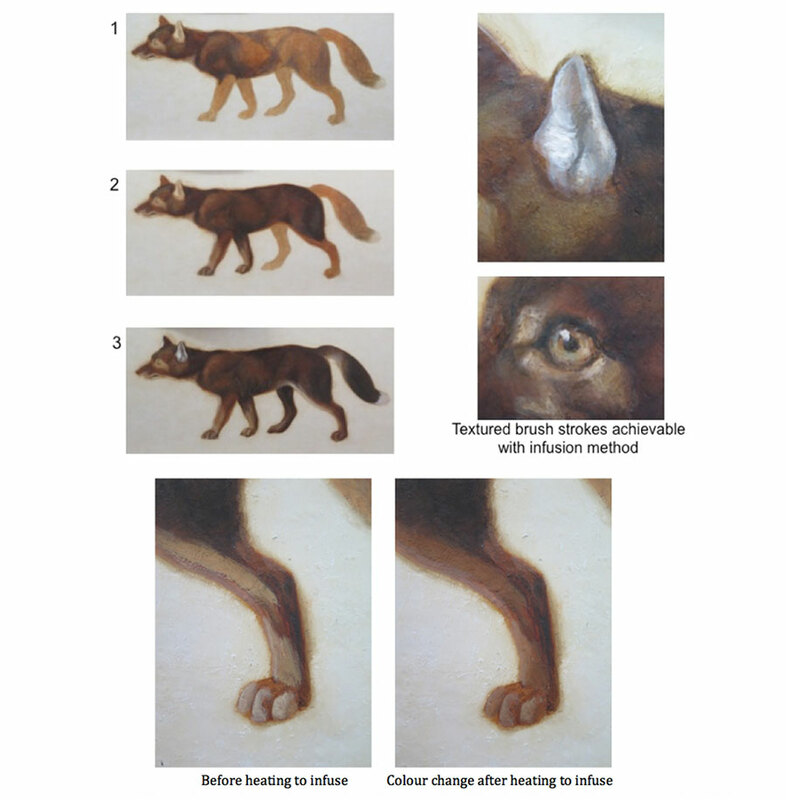 While the decisions made in this project were based on contemporary treatises, practical assessments of the various methods of wax painting and comparisons with the appearance of Portrait of a Large Dog (Dingo), it would never be possible to arrive at a definitive answer to this question. However, this was a wonderful opportunity to not only attempt to understand the material of wax better, but also to try to fathom the way Stubbs may have worked and follow how he may have made his decisions.